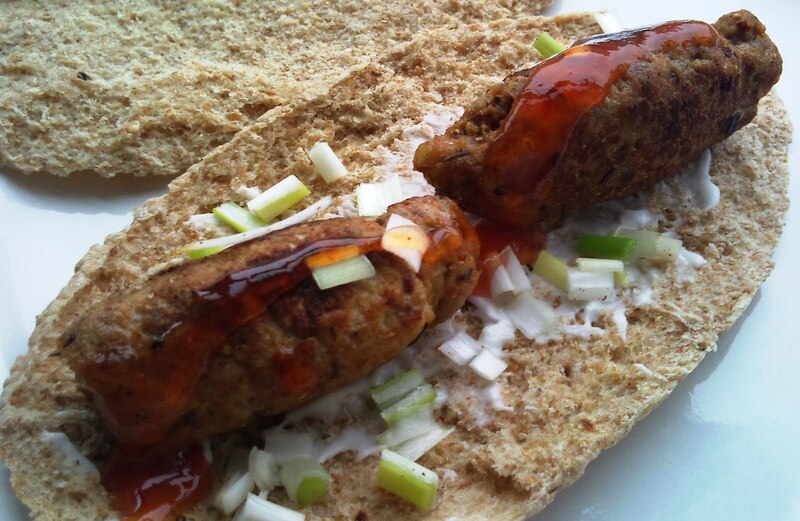 The following recipe makes 8 mini-koftas. You should serve two per pitta. Ideally you need 4 skewers to make these kebabs. Metal or wooden ones would do, but if using wooden ones, you need to soak them in cold water for 3-5 minutes before using. Wipe them dry after soaking. 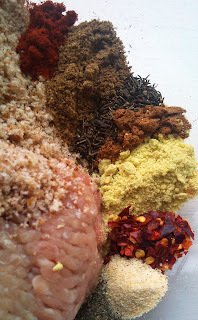 Add the turkey, breadcrumbs, stock cube and spices to a large bowl and combine, breaking the mince into smaller pieces. Next, add the egg and continue to mix well for a minute or so. If the mixture is a little dry, you can add a small splash of low fat milk. (If the mixture is too wet, you can add a few more breadcrumbs). To shape the koftas, I find its best to wet one hand. Divide the mixture into 8 roughly even portions. Take one of the portions in the wet hand and lightly squeeze it to make a sausage shape. Carefully slide the skewer into one end of the mince mixture and continue to mould it to form an even shape. Repeat this process with a second portion of meat and add to the other end of the skewer. Place the completed skewers on a clean plate or sheet of tin foil until you're ready to grill them. Heat the grill to a medium to high heat and add the kebabs. Grill for 15-18 minutes until they are browned and thoroughly cooked through, turning frequently. (A slanted grill like a 'George Forman' would also work well). Transfer the koftas to the warmed or toasted pitta bread and serve with the toppings. These are AMAZING! So tasty.